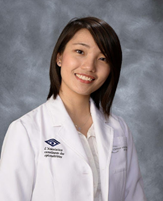 Dr. Yang obtained her Doctor of Optometry (OD) degree from the University of Montreal School of Optometry, in Canada. After graduating in 2016, She had the desire to deepen her knowledge in research and glaucoma. She moved to New York to pursue a Combined Residency and Graduate degree at SUNY College of Optometry. She obtained her Master in Vision Science in 2018. During her graduate studies, she presented multiple talks and posters in international conferences (ie ARVO, International Perimetric Society) with her advisor Mitchel W. Dul, Jose-Manuel Alonso, and Qasim Zaidi. Her research focused on psychophysical abnormalities in early stages of glaucoma. During her clinical training, she had the opportunity to precept students in primary care, low vision, and glaucoma clinic; through this experience, she discovered her passion for teaching. She has a heart for eye care mission works; she believes that her proficiency in English, French, and Mandarin will be useful in caring for the marginalized population.